If you’ve ever run a marathon, chances are you’ve probably seen a dude with spiky hair in a cape fly by. That marathon caped crusader probably high fived you, cracked a 4th grade joke or two, and then ran off to grab a GU at the aid station. That’s Endorphin Dude, and that dude is me. I run a lot of marathons. I run a lot of ultras too. And yes, I run in a cape and you will always see a big smile on my face. I am happy to be out there on the course because I never thought that I would be able to. Every super hero has an origin, and mine is pretty dark. 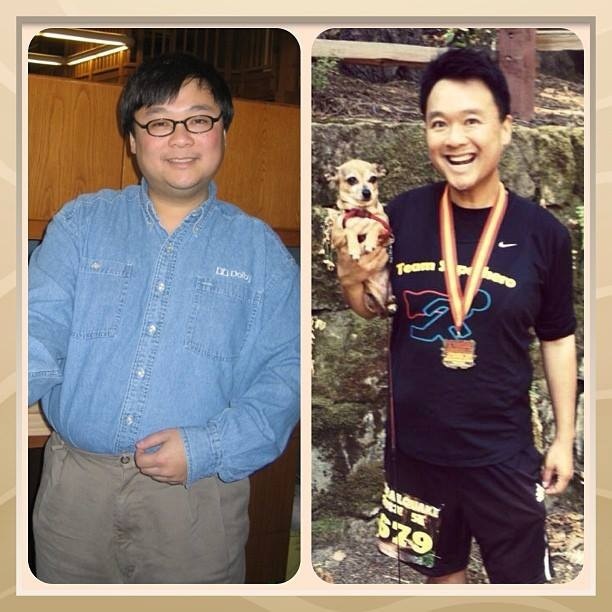 Five years ago, I was an insulin dependent couch potato. I spent my mid twenties and thirties in a cubicle slothed in front of a computer. When I got home from work, I would plop myself on the couch and watch TV while shoving my face with frozen pizzas, baloney sandwiches with extra mayo, and soda. The only exercise I got was taking my dog Chewbacca to the tree right outside my front door so that she could relieve herself, and that in itself was a laborious chore. I was always overweight, but the ten years I spent in that cubicle resulted in me ballooning up to a whopping 223 pounds. Mind you, I am only 5’6″. To make matters worse, that sedentary life style lead to many other health problems. I was barely thirty years old and had to take meds for type two diabetes, cholesterol, and high blood pressure. In my mind, though, it was ok. I kept telling myself, “Why do I have to exercise and lose weight? Modern medicine has made it easy for the obese American! All we have to do is take a magic pill and our cholesterol, glucose numbers, and blood pressure will be regulated! Give me another bacon sandwich!” Seriously, I believed that. My doctor flat out warned me that my glucose numbers had reached such an alarming level that I was two donuts away from getting my legs amputated. She punctuated that warning with this downer: “If you continue to live like this, you will not make it past 40.” I shrugged it off. As each day of my mundane junk food filled life passed, I became sequestered in my shoe box studio apartment. Laziness and denial dragged me further into Jabba The Hut mode. The vicious fat cycle repeated itself every day: wake up, go to work, sit on my rear in a cube all day, go home, plop on the couch, shove lethal toxins in the form of Ho Ho’s and deep fried hot dogs smothered in Ranch and blue cheese, fall asleep, wake up, and repeat. The sweat from my pores turned into a glue like substance and I pretty much stuck to the couch. There were numerous occasions when I couldn’t move my toes, let alone get up to take Chewbacca out to pee. Let’s just say that for a while, my apartment smelled like a doggie urinal. Yes, it was that bad. One day, the routine was broken by an unexpected event. I came home from work and collapsed on my living room floor. I thought I was having a heart attack. I felt numbness on the left side of my body and sharp pain in my chest. Chewbacca barked and ran around in circles as if she sensed she was soon going to become an orphan. I seriously thought my time was up. Fortunately, this was only a heart attack scare and not the real deal. After everything settled, I got up and took the dog for a walk. When I returned, my little dog snuggled up with me and gave me that don’t-ever-do-that-again sad puppy eyes. This was the turning point. I knew I had to make some changes in my life. I took Chewbacca for a longer walk the next day. The following day we went further. Before I knew it, my little mutt and I were pulling out multi-mile urban hikes throughout San Francisco. The weight quickly dropped and I found myself feeling better, both physically and mentally. Walking my dog became my therapy. Later that summer, a friend of mine said he was going to run the San Francisco Marathon. I told him I would be at the finish line cheering him on. This was brand new to me. I seriously thought a marathon was 10 miles! I also thought a 5k was a tax form. I knew nothing about about running. In any case, when all the runners came flying through the finish chute, I felt that second hand high. I wanted that feeling of euphoria for myself. I turned to the random stranger next to me and proclaimed, “I’m going to run this marathon next year!” I needed to say it out loud so that I would be held accountable. I stayed to the end and cheered on every runner. When the last marathoner crossed that finish line, I went home and researched all that I could on training for marathon. Because I am not a naturally born athlete, I had to start from scratch. I remember running that excruciatingly painful first mile. I went out way too hard. I didn’t know anything about pacing. It took me a few weeks to find my groove. I kept at it everyday and after many weeks of training, I successfully ran my first half marathon in October 2009. When I crossed that finish line, I felt like I had just won the Olympic gold medal. All my hard work was coming to fruition and it excited me even more to continue the marathon training. Once the endorphins wore off, reality sunk in and I quickly realized that running 26.2 miles was a lot harder than the half marathon. I finally understood what runners meant by “the wall.” It frustrated me to no end that I could not go beyond 18 miles! It got to the point where I had to play mind games to get me through those tough miles. In my head, I created an alternate world where I transformed into a superhero who needed to save the world, one couch potato at a time. During my training runs, I played this video game in my head, and every time I reached another mile, I would receive an energy pellet. I rewarded myself bonus points for dodging cars, knocking out coyotes on the trail, and side swiping bikers. All of a sudden, the pain I endured from miles 15 through 22 turned into a fun little quest to get to that finish line. Endorphin Dude was born! On July 25, 2010, I ran my first full marathon in San Francisco. When I crossed that finish line, I saw all the blood, sweat, tears, and GU flash before my eyes. What an incredibly surreal moment, one that felt like a euphoric out of body experience. I had never ever felt runner’s high to that degree. I knew that day that I would replay that moment in my head, over and over again, for the rest of my life. I was on that runner’s high for days, and I admit, I wore that medal around my neck when I took Chewbacca for her walk. My legs, knees, and thighs may have been completely banged up, but my heart kept yearning for more. 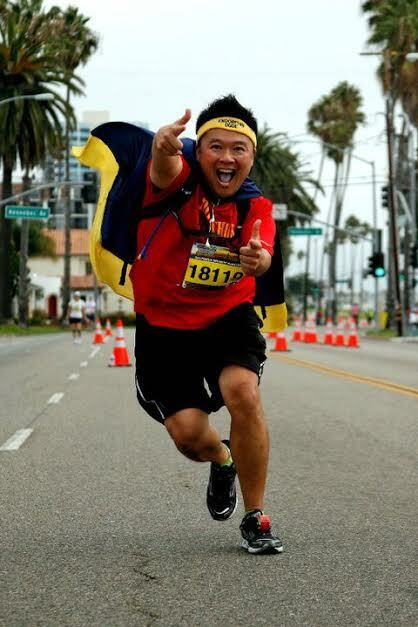 The San Francisco Marathon was supposed to have been my one and done bucket list race, but running makes me feel like a super hero. I am Endorphin Dude! Who would have thought that the guy who had a heart attack scare would become the Marathon Caped Crusader? I am definitely experiencing a cardiac infarction of the euphoric kind these days. Since that life changing day back in 2009, I have run over 100 marathon and ultras, with two of them being 100 mile endurance races. I really didn’t think about it at the time, but I owe a lot to my little dog. Every time I cross that finish line, I think about how my trusted side kick saved me. Chewbacca is a rescue dog with a pretty troubled past. She was a pregnant stray when the Peninsula Humane Society found her. There was probably some abuse that went on as well. Thankfully, the kind folks at that shelter took very good care of her. People tell me all the time that I did a good thing by rescuing this dog, but the reality is that she rescued me. I truly appreciate every aspect of life now. I really like the person I have become. A healthy dude is a happy dude. Life is good! It’s funny how happiness is less connected to events than it is to attitude. Some people are miserable despite having everything they’ve ever worked for. Some are constantly beaming sunshine in the face of hard times. It’s all in one’s outlook, and one’s outlook depends on how each and every thing in life is handled. I first heard this quote a few months ago, and I haven’t been able to shake it since. It is just undeniably true. Fighting for a purpose develops focus, determination, and toughness. Overcoming obstacles fosters pride, perspective, and humility. Through dealing with challenges and loss, a person grows. It’s not something that can be phoned in. It’s dark. It’s painful. It’s real. Cassandra is a friend and a notoriously bubbly personality in our Auburn-to-Bay Area trail race scene. She is always smiling and cracking jokes, as she undertakes bigger and bigger challenges. She is one of the running junkies who uses races as a way to tread new ground, both on earth and in her life. On October 15, 2012, Cassandra was diagnosed with IDC-Invasive Ductal Carcinoma, a common type of breast cancer. She has battled it ever since, undergoing chemotherapy while steadfastly refusing to compromise her lifestyle and goals. Cassandra has gone through every emotion a person can feel, and has used the challenge as a springboard to accomplish more, find love, and live life more fully. How did you feel at first? Shocked. Numb. Pissed off. I found it difficult to believe that someone like me who lives a healthy lifestyle and runs long distance could be diagnosed with cancer. Did/do you feel any sense of loss or grief? Yes. I went through the ‘why me’ stage when I was first diagnosed. For the first five months I didn’t go public with it. I only told a small handful of people because I didn’t want to deal with the questions, pity or emotions that the questions may evoke. What has been your lowest point emotionally? When I realized the chemo really was going to take my long hair and my eye lashes. My long hair was part of my identity for most of my life, and to lose it felt like I was losing a part of myself. Was there a specific turnaround moment? If so, what triggered it? When I completed a trail half during chemo and saw all my old buddies again. I felt strong and I felt loved. I realized that I CAN live life on my terms. I went public with my diagnosis after that race in March and felt stronger for it. Do you feel as if you are running toward something or away from something? Both. I’m running towards the bling at the finish line (as always) and running away from my fears, leaving all the garbage behind me. Is it difficult to maintain your determination? Are there times when you feel overwhelmed? It is only difficult when I am not working out or running. When I am not active, my thinking gets muddled and I lose focus and perspective on everything. Yes, there are times when I do feel overwhelmed. Right now I am trying to plan my wedding, which may be 18 months to 2 years in the future. Being this young in my diagnosis and trying to look that far ahead is quite a task for me and can be very overwhelming at times. How do you motivate yourself? What kind of goals do you set? I keep races on my schedule, volunteer at races and keep in contact with all my running friends. I draw off their energy and enthusiasm from their races and training. I am trying to pick up where I left off last year when I was diagnosed. Always having a race to work for keeps me training and working towards something, instead of just aimlessly running. What or who has helped you along? My mom, my fiance, a few close friends and RUNNING!!!! In retrospect, what has been the hardest part? Admitting that I have cancer. Taking on the challenge of beating this thing. What has brought you joy during the journey? Having people share their stories with me about themselves or loved ones going through cancer, and finding out who my friends are and discovering that I have so many people who love me. What have you learned about yourself and the way you handle things? I am stronger than I even I knew. This is teaching me patience and how to rely on meditation and relaxation techniques. What has it changed about you? I have stopped taking things to heart. While I care about my friends, I am not changing who I am for anyone! Gone are the days where I worry about what others think about me. What other’s think of me is really none of my business. I have a life to live. I am focused more on living and getting the most out of each day. I have stopped rushing through my day and now appreciate the small things in life and believe in the song “Love Like Crazy”. How has it affected your view of other things in your life? I don’t take anything or anyone for granted. Do you consider yourself a better or stronger person for having gone through the experience? I don’t know about being a better person, but as I approach my one year mark (Oct 15) I know I am a stronger person. You can’t deal with cancer, chemo AND run an Ultra and not come out a stronger person! Cassandra recently completed her second 100 miler at Run De Vous here in Northern California, which is exceedingly appropriate in that the race is pretty much a gathering of friends who support each other as they all struggle to reach their goals. It is about loving the journey and living life on your own terms, with your own goals. Life isn’t fair, and often it throws difficult things at us, but knowing that there are people in this world like Cassandra can serve as a reminder that it doesn’t have to rule you. It doesn’t have to steal your identity. You can find strength you were unaware of and deal with hardship with tenacity, hope, humor, and class. P.S. : I will supply her with a link to this blog, so feel free to leave any thoughts or reactions for her here.